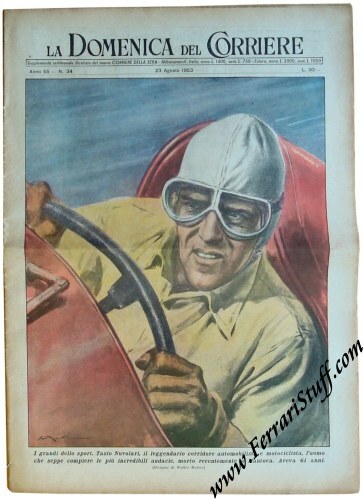 Original August 1953 issue of la Domenica del Corriere on the death of Tazio Nuvolari. 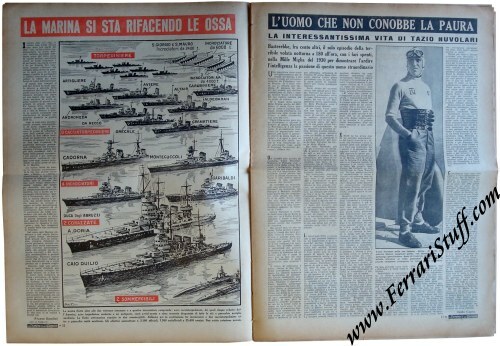 This is a complete vintage August 23, 1953 issue of "La Domenica del Corriere" with great artwork of "Nuvola" on the front cover. This cover is also sold as a modern print but here you have the opportunity to acquire a 1953 vintage original. It is in good condition but the (rope!) binding is extremely fragile and a number of pages have come loose as a consequence. This would make this copy extremely well suited to have the great cover framed. It measures some 29 x 40 cm or 11.5 x 16 inches. The inside contains a 1-page article on Nuvolari which is captioned (freely translated) "The man who knew no fear. 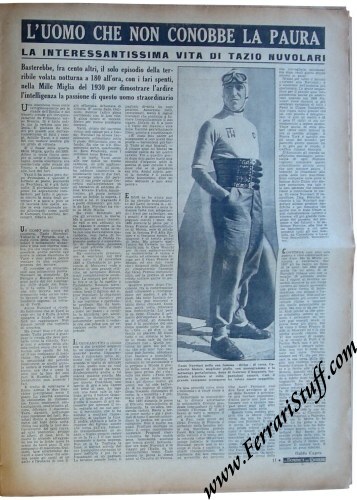 The interesting life of Tazio Nuvolari".